Waynesburg University hosted the annual President’s Donor and Scholarship Recognition Dinner Saturday, April 6. Presented at the dinner were the Golden Key, Distinguished Alumni and Young Alumni awards. 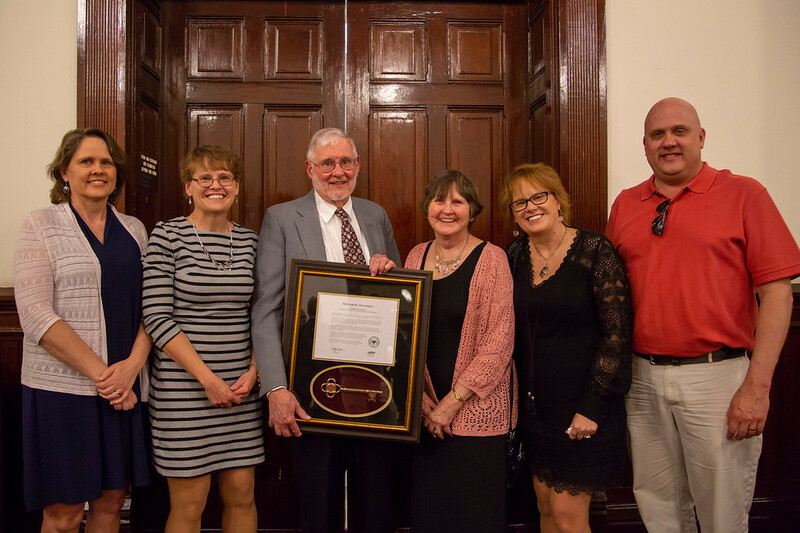 Dr. Ron and Mrs. Judy Montgomery received the 2019 Golden Key Award, Ms. Diane Hughes received the 2019 Distinguished Alumni Award and Mr. Ryan Devlin received the inaugural Young Alumni Award. This year’s recipients, Dr. Ron and Mrs. Judy Montgomery, were recognized for their generous support to the University in the form of worthy student scholarships. Aligned with their passions for chemistry, nursing and student travel, their scholarships provide educational opportunities to students in these areas that might not otherwise be possible. 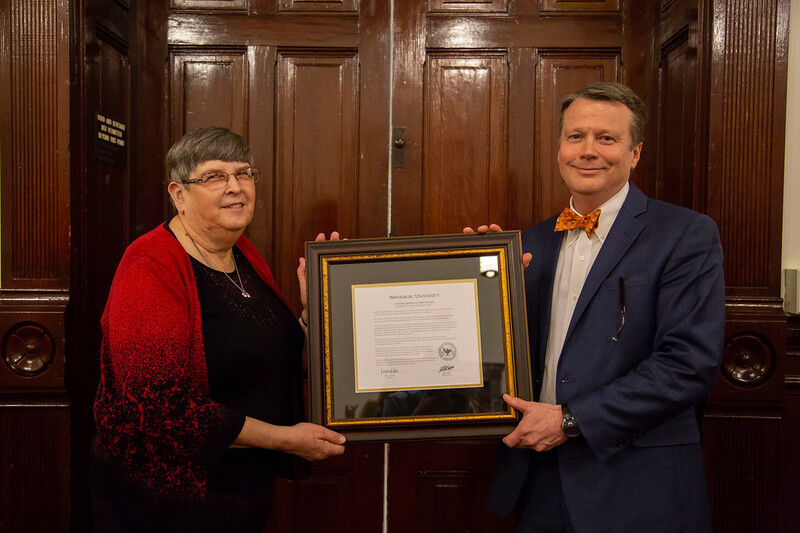 Ms. Diane Hughes was recognized this year for her devotion to Waynesburg and for all the ways in which she exemplifies the mission of the University. The newly created Young Alumni Award is presented to a young alumnus, under the age of 35, for their accomplishments and service, by having distinguished themselves as a leader among their peers and in their profession, community and/or the University. 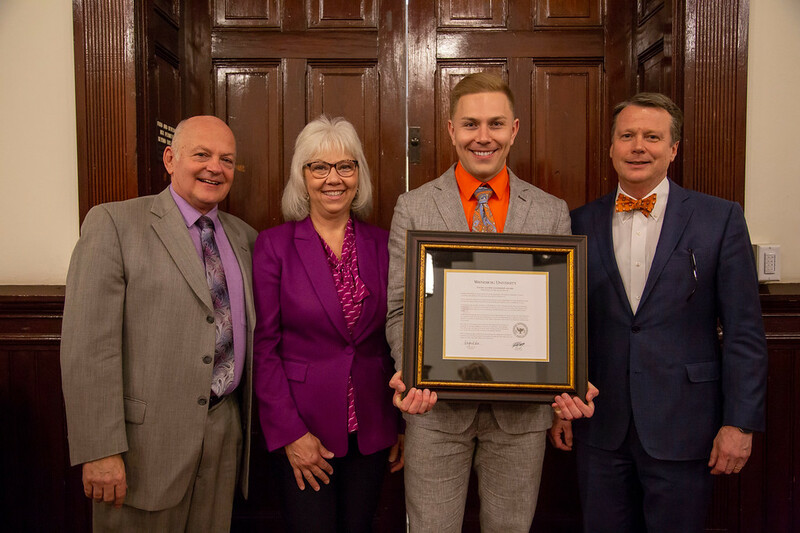 Having been honored as the 2013 Pennsylvania Teacher of the Year, Mr. Ryan Devlin has made a positive impact in his profession and in the communities where he has served. Ron was a scientist in the Agricultural Products Division of FMC Corporation, retiring as the director of research and development. Currently, he is an active member of the Audubon Society and several genealogical groups. He earned his bachelor’s degree in chemistry from Waynesburg University and a doctorate in organic chemistry with a minor in biochemistry from Duke University. Judy enjoyed a career in nursing, serving in the surgical and obstetric units of various hospitals. She has been involved with the American Red Cross, homeless shelters and meals on wheels; and she remains active in church activities such as Caring Callers and Presbyterian Women. She is also an active member of Daughters of the American Revolution. She received her BSN degree from the University of Pitts-burgh. In 2002, Ron and his classmates established The Herbert Siegel Scholarship in honor of their esteemed chemistry professor. More recently, the Montgomerys initiated The Ronald E. and Judith A. Montgomery Endowed Fund for Student Scientific Travel and The Ronald E. & Judith S. Montgomery Endowed Excellence in Nursing Scholarship. Prior to her retirement in 2013, Diane spent 27 years with Ross Mould, LLC, in Washington, Pennsylvania, as a corporate accountant. Previously, Diane served in an accounting role with the Greene County Commissioners. She earned two business degrees from then-Waynesburg College: a bachelor’s in accounting in 1974 and an MBA in 1986. Diane grew up in the Presbyterian Church and as an adult, served as both an elder and a deacon. She is now a member and the financial secretary at Oak View United Methodist Church in Waynesburg. Diane also spent time heavily involved in Harveys-Aleppo Grange #1444, once earning Granger of the Year honors for her work. In memory of her late parents, Diane established The Eugene and Mary Lou Hughes Family Endowed Scholarship at Waynesburg University. Ryan, a high school multimedia teacher and media specialist at Fox Chapel Area School District, has previously taught at Hughes Primary School in Canberra, Australia, and Brockway Area High School in Brockway, Pennsylvania. In 2013, he was named Pennsylvania Teacher of the Year and was honored at the White House by President Obama as a finalist for National Teacher of the Year. Throughout his teaching career, Ryan has been a cross country coach, grant writer, department chair and Teaching Channel contributor. Last summer, Ryan traveled to Ethiopia on a Fulbright-Hays Scholarship where he wrote curriculum and produced an educational documentary on Ethiopian folklore. Ryan earned a bachelor’s degree in secondary English education at Waynesburg University and a master’s degree in educational leadership at California University of Pennsylvania.